Discord just released an awesome new page on their website geared directly towards streamers. 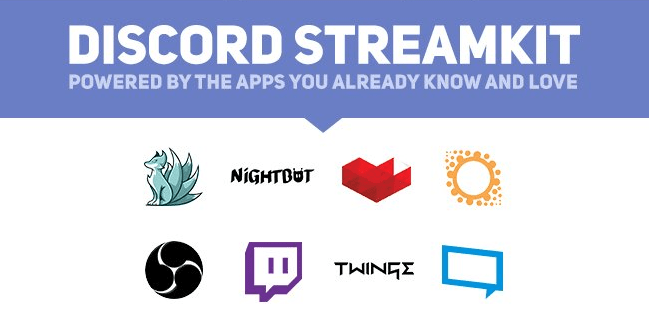 Named the Discord StreamKit, this handy page lists all the possible tools and integrations you can add to your Discord server that is associated directly with streaming. Twitch and YouTube integration have already been part of Discord for a while, allowing Partners to automatically give your subscribers a special role. Two new integrations have been made available – Nightbot and Muxy. The Nightbot integration allows for special roles for your Nightbot regulars and moderators on Twitch, the use of Nightbot commands, and the ability to filter spam and create a chat blacklist. Muxy also brings some awesome features: notify your Discord channel when you go live, show follows, donations, subs, and host alerts, display a summary of your stream stats after you go offline, and other statistical data. There are a few announced integrations coming in the future. GameWisp will allow your subscribers to sync to special roles based on their tier or benefit. Twinge will be able to send you a post-stream analysis and notify you of new Twinge reviews. XSplit and OBS integrations will allow you to share text chat from any channel on stream, show who’s talking in a voice channel, and much more. The Discord StreamKit also shares a few fun possible integrations. Mee6 allows for custom commands and a level up system for server participation. Airhorn Solutions is great for annoying your viewers while Septapus has number trivia. If you are a streamer and don’t have a Discord server, why not? We wrote a great guide for growing a Discord server as a streamer, check it out! Make sure to join our own StreamerSquare Discord server.